The events of 9/11 shocked the world when US jetliners taking off from US soil hit two of their landmarks, one the symbol of US economic might and the other a symbol of its military might. It was a blow to the US aviation authorities, intelligence, and military because they all failed to prevent these horrible acts of terrorism before they happened or to intercept them while they were happening. 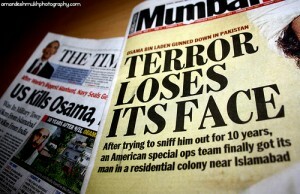 Disregarding conspiracy theories both within and outside the USA, the Bush administration hurriedly told the world that a certain Osama Bin Laden (OBL) was behind this act of terror. The USA did not deem it necessary to provide evidence for this conviction even to the Taliban regime in Afghanistan, despite their insistence when the USA demanded they hand over OBL or face war. This demand was rejected on the pretext of national security and what followed has come to be known as the ‘War on Terror’. Ten years after this global ‘War on Terror’, Obama announced to his people and the world that the hunt for OBL had ended as US special forces had killed and then buried him in the murky waters of the Arabian sea. We were told that he had been hiding deep inside Pakistan, in a compound in the garrison city of Abottabad, just a few hundred yards away from the Pakistan Military Academy. The operation was carried out by US special forces who secretively flew straight from Afghanistan to the compound at night, killed OBL, carried him back, took him to the sea, and ‘buried’ him there after ‘due funeral proceedings’ according to a statement by the White House. The events spanning almost 10 years—from 9 September 2001 when the USA was attacked and the hunt for OBL began, until 2 May 2011 when the USA announced that justice had been served—mark an important era of modern times that has affected the world in fundamental ways. While the whole episode might be entertaining to some like a Hollywood movie, the world needs to take stock whether justice was actually done; to justice itself, to the allies of the USA in this expedition, and to the world at large. There seem to be a number of things that went wrong and do not bode well for the future of the world. This article is meant to highlight these wrongs committed during the ‘War on Terror’. First, based on the experiences of history and evolution, humankind has agreed upon a fairly refined set of values and procedures that constitute justice. While there are a few differences here and there in the justice systems of individual nation states, there is a consensus about the minimal procedural requirements to bring about justice. Even a cursory view of the case indicates a gross violation of justice throughout this period, right from the beginning to the end. The Bush administration did not provide any concrete evidence to the world or even to its own courts of law for convicting OBL in relation to the 9/11 attacks. The administration charged him and others based on its own intelligence reports and went on to hunt them. As proven in the case of WMDs of Iraq, intelligence reports can be grossly mistaken. What the world has witnessed is that during the 10 years of the ‘War on Terror’, neither OBL nor any of his colleagues were ever tried, charged, convicted, or warranted by any court of law to be arrested let alone executed. The inherent injustice involved in this practice aside, this is also an injustice to the families of the victims of who can never be certain that justice has actually been served to them if a fair trial does not take place. In the same fashion, the USA captured a large number of people from around the world and held them in Guantanamo for an indefinite period without affording them due access to the procedures of justice. The world has known very little about these prisons, operated outside its territory and jurisdiction, which were set up for so-called ‘enemy combatants’ who are not even given the rights of a prisoner of war as stipulated under the Geneva Convention. Unfortunately, this practice has diffused around the world in many forms and manifestations. In developed countries, it has resulted in the frequent infringement of individual liberties and rights in the name of national security. In developing countries, the situation is even worse because security apparatuses have systematically morphed into modern-day gestapos, causing massive violations of the human rights set out in the UN charter. For instance, the cases of hundreds of missing persons allegedly abducted by intelligence agencies has been lingering for years in the Supreme Court of Pakistan while the locations of the abductees remain unknown. Second, in the run-up to the war, the Bush administration had used a simple and mutually exclusive choice of being ‘either with us or against us’ to judge other nations as either friends or foes. Indeed, no responsible nation would have liked to add insult to the injured USA by being against her at that stage and thereby invite her wrath. While the choice was straightforward for most, it was probably the greatest diplomatic dilemma in the history of Pakistan, for several historical and strategic reasons. Pakistan had long been an ally in the USA’s proxy war against the Soviet Union in Afghanistan, but the USA abandoned Pakistan immediately after the Soviet withdrawal. Pakistan was left to host millions of Afghan refugees who had migrated to and assimilated in Pakistani society over the decades. This assimilation was so undetectable that an average native Pakistani could not tell between an Afghan and a Pakistani from the border region of Khyber Pakhtunkhwa . Afghans were allowed to enter, work, marry, and live anywhere in Pakistan; indeed the country kept no proper record of Afghans, including a whole generation born and raised in Pakistan. This poor nation started to computerize the records of its own residents only in 2000, and at the time of launching this ‘War on Terror’, the reins of power were in the hands of military dictator Pervez Musharraf who had toppled an elected civilian government. Internally the regime desperately needed the support of domestic religious political parties which had significant influence in the KPK due to its geographic, ethnic, and cultural bonds with Afghanistan. Above all, Pakistan’s close and friendly relations with neighbouring China, which happens to have a history of difficult relations with the USA, added complexity to the scenario. Being part of the US-led war in the backyard of China had important geostrategic implications from China’s perspective. In this context, the choice between ‘with or against the USA’ was not as simple for Pakistan as for most other nations in the world. Being friends with the USA meant not only creating millions of foes integrated within the very fibre of its own society but also sowing the seeds of enmity with a neighbouring country. On the other hand, the repercussions of not being a friend of the USA are not too difficult to imagine. This choice invariably meant a deep split within Pakistani society and exposing it to severe dangers in either case. Nevertheless, Pakistan chose to side with the ‘victim’ and since then it has been providing every support to the USA in its ‘War on Terror’ despite all the difficulties; the only acknowledgement it gets for its sacrifices is the US demand to ‘do more’. Pakistan has been used as a haven for terrorists due to its proximity and unguarded border with Afghanistan, which has been a land of war and lawlessness for several decades. The roots of this terrorism go back to the days when the USA generously sponsored the recruitment and training of non-Afghan Muslims to be part of a jihad against the Soviet Union, in which Pakistan was used as an operational base by the USA. In those days, the USA was the greatest sponsor of jihad simply because it was against its arch rival. After the Soviet withdrawal from Afghanistan, the USA abandoned Afghanistan and Pakistan without helping to clean up the mess it had created, while leaving behind a mass of arms and undisciplined warriors. It is not difficult to imagine that while two generations of Afghans had grown up seeing war as a normal part of life, what else could be expected of them but to fight. Therefore while the victor Afghans split into ethnic factions and busied themselves in the battle for power, foreign jihadislost interest in the local struggles and for the most part quit. While they were splinters of a large social network formed during the Afghan war, they naturally started clustering in certain areas—where their Muslim brothers were facing real or perceived aggression. This time the aggressor turned out to be the West in general and the USA in particular through its silence and apparent complicity with aggression in Palestine, its slow response to the ethnic cleansing of Muslims in Bosnia, and its military presence on Muslim lands in the Arab world. The first Gulf war was seen by these jihadists as an orchestrated campaign by the USA to establish complete control over Muslim lands and their oil by establishing permanent military bases within their borders. . This provided sufficient motivation to these Afghan war veterans to rewire their social network to combat the new enemy. This also provided the needed motivation and ammunition for further recruitment and expansion of this network. The only difference between the struggles against the aggression of the two superpowers is that in the former case, it was sponsored by the West and touted as jihad, and in case of the latter, the West itself, led by the USA, became a target and hence the resistance has been rebranded as ‘terrorism’. So what the whole world is reaping today is what was sown by the USA during the cold war. The irony is that the USA left Pakistan in the lurch to face terrorism after the Soviets pulled out of Afghanistan, but got a rude awakening on 9/11. Pakistan is attractive to these fighters because of their intimate social contacts nurtured during the Afghan war, its ethnic and linguistic diversity, mountainous terrain, huge population of 180 million, and above all their knowledge of the country. It is therefore no surprise that many of the most wanted Al Qaeda operatives and high value targets were captured by Pakistani security forces within its territory. These include Umar Patek who was arrested 29 March 2011 in Abottabad by Pakistani authorities on a tip-off from the CIA. The Indonesian militant was accused of playing a key role in the 2002 Bali bombings and long seen as a crucial link between Al Qaeda and its Southeast Asian affiliates such as Jemaah Islamiyah. The alleged ‘mastermind’ behind the 9/11 attacks Khalid Sheikh Mohammad was captured 1 March 2003 in Rawalpindi by Pakistani Inter Services-Intelligence (ISI) officials in a joint raid with the CIA’s Special Activities Division paramilitary operatives. Ramzi bin-al Shibh, one of the first five names on the FBI’s list of ‘Most Wanted Terrorists’ was captured on 11 September 2002 in Karachi in a joint Pakistan-US operation. Abu Zubadeh was captured 28 March 2002 in Faisalabad by Pakistani military intelligence, accompanied by CIA and FBI personnel during the massive raid on his compound. Abu Faraj al-Libbi, believed to be Al Qaeda’s No. 3, was arrested 2 May 2005 in Mardan by Pakistani intelligence officers. Ahmed Ghailani was captured in Pakistan on 25 July 2004. Mustafa Ahmad al-Hasawi, a Saudi, believed to be one of two key financial figures to have arranged funding for the 9/11 attacks was also captured in Pakistan in 2003. The irony is that while Pakistan has been struggling with the menace of terrorism ever since the Afghan war, the world only came to realize it after 9/11 and seems to believe that Pakistan is a terrorist state or that all Pakistanis are potential terrorists. Nothing could be further from the truth. Pakistan has lost thousands of its soldiers and civilians while fighting the USA’s war; in direct combat with militants as well as in suicide attacks in the mosques, streets, markets, and public places across the country. Pakistan even launched military operations within its own territory causing history’s biggest internal displacement of people which ran into millions. Pakistan also gave the US a free hand to conduct drone attacks on terrorist hideouts within its territory as and when it deems necessary. These drone attacks alone have resulted in the killing of thousands of people, written off as ‘collateral damage’. How the innocent victims of these attacks avenge themselves is yet another story. Pakistan also provided reasonable access, support, and information to the US intelligence apparatus to work within its territory. The fact that US intelligence operative Raymond Davis killed two of its citizens in cold blood but was subsequently released, also demonstrates the unflinching support the USA has received from Pakistan. Despite all of Pakistan’s sacrifices, and being the greatest victim of terrorists, the operation against OBL has been conducted in a way that denigrated and defamed Pakistan giving the impression to the world that Pakistan is complicit with Al Qaeda or protected OBL. Although Pakistan has captured most of Al Qaeda’s leaders and operatives and handed them over to the USA in the absence of any extradition treaty, the allegation that Pakistan would aid and abet OBL makes little sense. If the US intelligence and security forces had failed to detect terrorists and prevent 9/11 in their homeland despite all their sophistication, does this prove or indicate that they were complicit with the terrorists? Besides this allegation, the US operation without confiding in Pakistan has cast an unmistakable message that she does not consider Pakistan even an ally let alone a friend, neither does she care about its sovereignty. By doing so, the USA has provided the fuel and ammunition to those who believe and propagate that the USA has been zeroing in on Pakistan as the target for the next expedition after Iraq and Afghanistan. It must not be difficult for one to imagine how this message is going to affect public opinion in Pakistan and elsewhere and how it will help the ‘War on Terror’. Furthermore it has set a dangerous precedent that may be seized on by India, which already believes Pakistan to be harbouring terrorists. Third, what indicates a dangerous evasion of justice is the way OBL was executed. Although there were initially contradictory statements from various officials of the Obama administration regarding the status of OBL at the time of the operation, we now have a unified stance from the administration that he was neither armed nor resisted in any way. It must be remembered that although he was declared an enemy of the USA in the war, the operation took place in a non-combat zone. Therefore, according to the known procedures of justice even in times of war, he should have been captured as a prisoner. Regardless of who he was, killing him in front of his family when he was unarmed, unguarded, and did not resist, constitutes a war crime. This entire episode starting from OBL’s conviction by the Bush administration and his execution by the Obama administration either constitutes a capital crime or proves that the US administration is the ‘supreme court of the world’ which has the right and authority to accuse anyone of a crime, order their hunt, and execute them anywhere in the world without the need to prove them guilty. Is there any other plausible conclusion if the world cares about justice? Fourth, as if there were not enough unanswered questions in this unprecedented killing of a terror suspect by US special forces on Pakistani soil, the US authorities made it more controversial by not providing any appropriate evidence of the claim that they had actually succeeded in the hunt for OBL. It has been a routine practice of US authorities to make such information public to lend credibility to the US ‘claim’ of success in relation to any declared enemy. For inexplicable reasons, the US administration seems to encourage conspiracy theories by not releasing that minimum information, which in no way seems to endanger their cause or their national security. The CIA transmitted a mugshot of Khalid Sheikh Mohammed to news agencies around the world. Photographs of the dead bodies of Uday and Qusay, the sons of Saddam Hussein, killed by US Task Force 20 in a showdown in Mosul in July 2003 were also released by the USA. For that, Paul Bremer had reasoned, “I think it will help convince people that these two people are dead…”. When Saddam Hussein was captured alive in December 2003, video footage was released showing a doctor supposedly examining and ascertaining that it was in fact Saddam Hussain. Similarly, the US government released a photo of Abu Musab al-Zarqawi’s corpse after he was killed in a US air strike in June 2006. One wonders why the US administration needed credibility of success in relation to Uday and Qusay but not in case of OBL who was the proclaimed raison d’etre of the ‘War on Terror’. The USA actually needed more credibility now than at the time of killing of Uday and Qusay. She suffered a crisis of credibility after the world learned in 2004 about the torture going on in Abu Ghraib prison, the falsehood about WMDs in Iraq, Bush’s acknowledgement of the existence of ‘black sites’ (i.e. secret CIA-run prisons across Europe), and Obama’s retreat on the closure of Guantanamo. The most concrete evidence supporting the claim that OBL had been killed would have been his dead body, which as they put it no longer exists. It was thrown into oblivion, dumped it into the North Arabian Sea from USS Carl Vinson within hours of his execution. Where did this sea-burial come from? The chief advisor of President Obama for Homeland Security and Counterterrorism, John Brennan, claimed that it was done in “strict conformance with Islamic precepts and practices”. One wonders which Islamic scripture teaches sea-burials; it is a phenomenon unheard of so far in Islamic history and literature. It is true to the extent that Islam discourages unnecessary delays in burial, but there are no time limits prescribed in Islam in relation to burial. It is a well-known practice that burials may be halted until close blood relations of the deceased arrive to see the dead body and attend the funeral proceedings if they so wish. This may, however, be the practice prescribed by the US administration to bury the alleged terrorists of Islamic faith within 24 hours of their death, and that too, in deep waters. Even if such claims may be excused for want of their poor knowledge about Islam, the White House could have come up with other plausible reasons for their claim instead of making a mockery of Islam by using it as a false pretext and adding insult to the injury of OBL’s family. Fifth, the US administration has attempted to make the world believe that this was one of the best-planned operations in recent times. Obama has been said to think for days on whether to ‘go or not’ to catch OBL in an operation which, had it failed, could have had serious foreign policy implications for the US. The planning of such sensitive and expectedly successful operations also includes planning the post-operation scenario including the first announcement by the President or subsequent responses to the press by other administration officials. However, the success of this operation has been tainted by conflicting and contradictory statements from various officials within the Obama administration. Their original assertion was that their Navy SEALs engaged in a “prolonged firefight”, which was later contradicted by an NBC report citing US officials that “four of the five people killed in the operation, including bin Laden, were unarmed and never fired a shot”. Similarly it was initially reported by officials of the Obama administration that OBL was armed and resisted using his wife as a human shield, all claims which were later contradicted by the administration itself. Immediately after the 9/11 attacks President Bush said: “we will not allow this enemy to win the war by changing our way of life or restricting our freedoms”. Since the heinous 9/11 attacks and the equally heinous ‘War on Terror’, the very fundamental principles and values of freedom and justice have been compromised by the West, especially by the USA itself. Be it freedom of speech, right to information or presumption of innocence unless proven guilty, most of the fundamental values have been suspended or pushed aside in the name of security. For instance, the Guantanamo phenomenon and the PATRIOT Act are two clear examples; but much more runs deeper. President Obama was seen as a tide of change in this regard not only because of his anti-Bush policy of rhetoric during his election campaign but also because of his inauguration pledge that “the US does not have to continue with a false choice between our safety and our ideals”. He was even given a Nobel peace prize in advance of any concrete achievements in the hope that the USA under his leadership would bring about peace in the world. But the world has witnessed President Obama proposing a law of ‘indefinite preventive detention without a charge’ instead. He has already betrayed his own pledge to “restore the standards of due process and the core constitutional values that have made this country great even in the midst of war, even in dealing with terrorism”. What we have witnessed during this era of modern terror suggests that the freedoms and rights which the West in general and the USA in particular champion, have already been sacrificed by their protectors on the altar of ‘War on Terror’. Is it a sign that terrorists have made significant progress in the real battlefield that matters to the peace of the world? US administrations never fail to tout their values of freedom and justice but their actions always fail to conform to their claims. Consequently, the USA provides good reasons to a large part of the world population, mainly Muslims, to believe that it applies different standards of freedom and justice by discriminating on the basis of religion. There is also a feeling that the USA applies different standards of justice and human rights for its own citizens compared to foreign nationals, particularly Muslims. It seems to us that the actions of the USA have shaped a global system of actions and reactions which has the potential to turn the theory of clash of civilizations into a self-fulfilling prophecy. *Both authors are PhD fellows in economics and policy studies of technical change at United Nations University-MERIT (UNU-MERIT) in the Netherlands. The views expressed in this article are solely those of the authors and do not necessarily reflect the views and policies of UNU-MERIT.